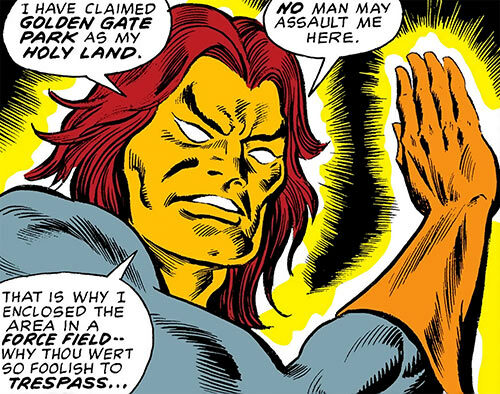 The Dark Messiah only appeared in 1973, as part of a… strange Daredevil & Black Widow extended storyline. That was during the Conway-then-Gerber run, after the protagonists relocated to San Francisco. This is one of those tales where somebody will inevitably go “man, 1970s writers sure dropped acid lol”. But though the material hasn’t been reused much, it has interesting potential. 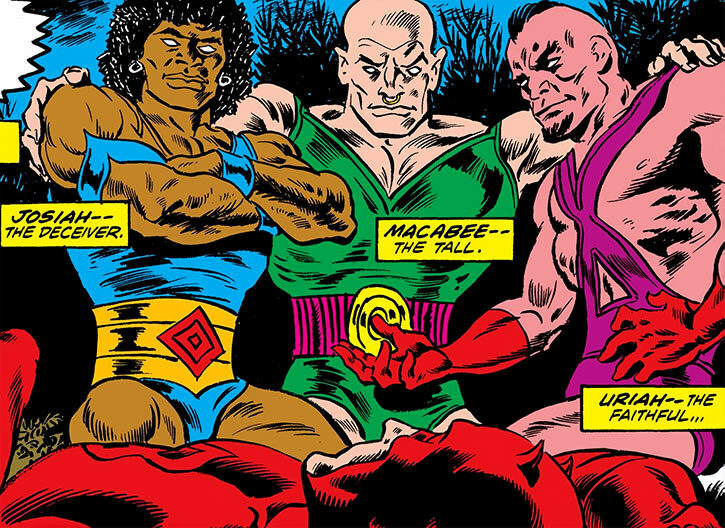 Group Affiliation: Servant of Moondragon. Mordecai Jones was a brilliant gymnast. His remarkable agility wasn’t diminished in any way when he became the Dark Messiah – if anything, it was enhanced. 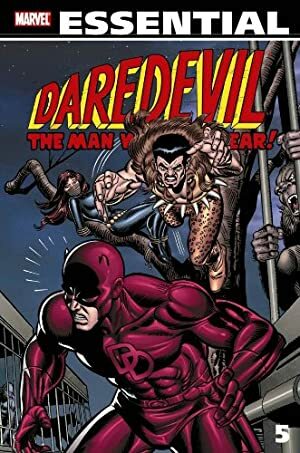 The Dark Messiah seemed faster and more accurate than even Daredevil (Matt Murdock), a near-peak-human fighter and acrobat. He was also given superhuman strength and durability. 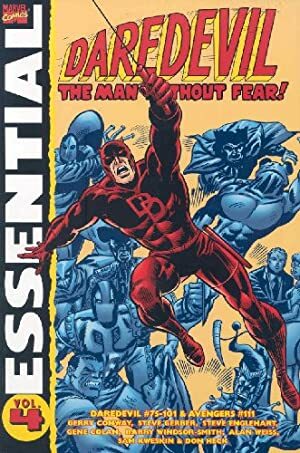 The Messiah seemed bulletproof, and Daredevil’s blows didn’t achieve anything. Daredevil noted that his heart was impossibly slow, and his bone structure had been altered. One of Jones’ remarks implies that he could hear the superficial thoughts of a person. The Messiah strides softly and silently. 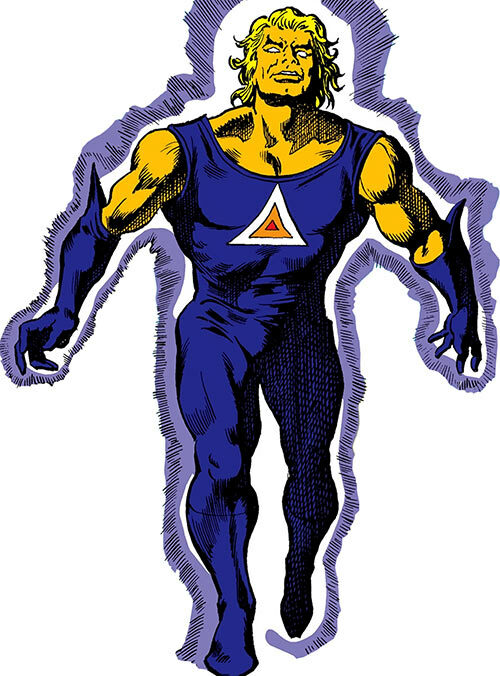 However, he’s unlikely to opt for stealth, preferring to glow and make thunderous declarations. One gets the faint impression that Titanian technology turned Jones into an approximation of an Eternal. Beyond his physical power and precision he could emit a variety of eyebeams and erect huge bubbles of impenetrable force. He could also teleport away, along with his disciples if need be. Howbeit, it is entirely possible that this was done by Moondragon, rather than a capacity possessed by the Messiah himself. No man may stop the disciples of doom ! Early on the Dark Messiah was accompanied by three super-powered disciples. Each had but a single power. One could project vibration blasts, another could manipulate earth and lava, and the third could project illusions of an alien environment. These illusions were devastating, leaving people drained and completely disoriented. Furthermore, all three disciples were fit and muscular. They also likely had criminal and fighting experience. The power of all three disciples was derived from the Messiah’s. But whether he empowered them directly — and thus could create new disciples — is unrevealed. It seems more likely that the disciples were a direct product of Moondragon’s tech. For all his power, the Dark Messiah’s main drawback was that he was insane. His strategies were fickle and made little sense. Back in 1973, Mordecai Jones was a talented street performer. He demonstrated gymnastics and acrobatics on San Francisco sidewalks. But one day a skittish dog, frightened by his moves, attacked him in mid-sommersault. Surprised, Jones fell and cracked his head on the pavement. The patrolling Daredevil helped get him in an ambulance. Nevertheless the young man was half-lost in the shuffle at the hospital. A shadowy figure then absconded with the unconscious Jones and his gurney. Using equipment within a secret room in the hospital, the kidnapper turned Jones into a superhuman. The abducter was likely one Kerwin J. Broderick, or one of his agents. Broderick was an ally of Moondragon (Heather Douglas), who back then operated as “Madame McEvil” . The technology used to empower Jones was thus of Titanian origin. Mistakenly thinking that Earth had been conquered by Thanos, Moondragon, had been creating superhuman agents to fight the Mad Titan. But Broderick was manipulating her in a bid to merge with the Titanian doomsday weapon called Terrex. As the Dark Messiah, Jones rampaged several times in San Francisco. 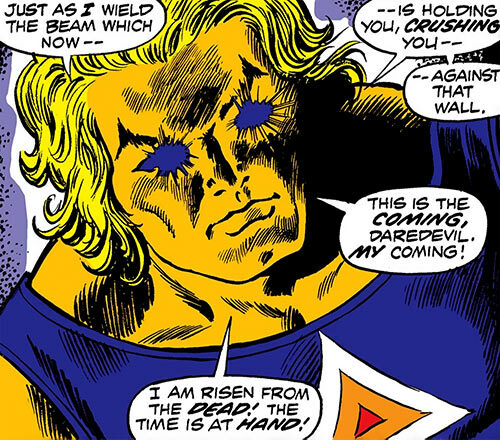 During his first outing he beat Daredevil with but a gaze, and disintegrated a prison’s wall to recruit “disciples”. Having freed more than 200 criminals, he took them to the Golden Gate Park. There, he erected a force bubble with only one opening at its apex. The SFPD helped Daredevil get inside to confront the Messiah. However, Jones soon chose to teleport away along with his disciples. What happened to most of the escaped prisoners is unclear. On the next day, the Dark Messiah sent his three superhuman disciples to terrorise San Francisco. But they were soon stopped by Daredevil and a wounded Black Widow (Natalia Romanova). However, the Dark Messiah then teleported in, depowered his disciples. The mutated Mordecai beat up Daredevil, killing a shopkeeper in the process. Daredevil then realised that the Dark Messiah was the acrobatic youth he had seen a few days before. When confronted with this, Jones was unable to handle the truth. He apparently exploded. Ramrod was awakened from his coma. 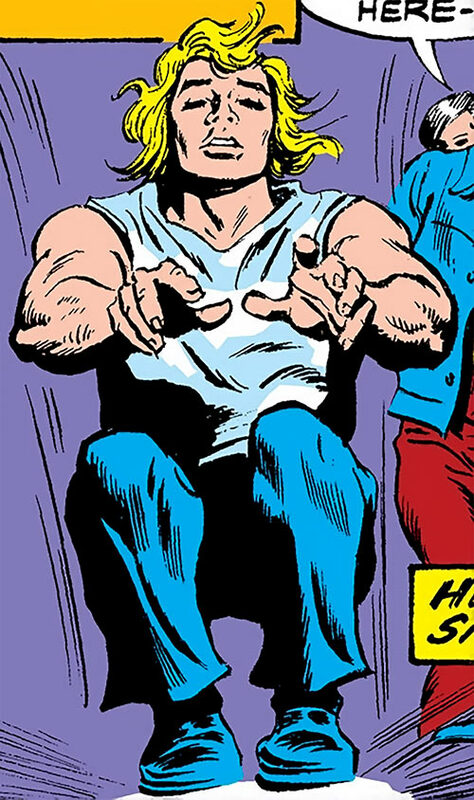 Angar the Screamer recovered his power. The Dark Messiah was rebuilt from thin air at the spot of his detonation. However, minutes later, she learned from Daredevil that she had been deceived. Kerwin Broderick turned against her, took control of her agents and proceeded to merge with Terrex. The Dark Messiah erected a force bubble around much of San Francisco, then rampaged to announce the rule of Broderick. 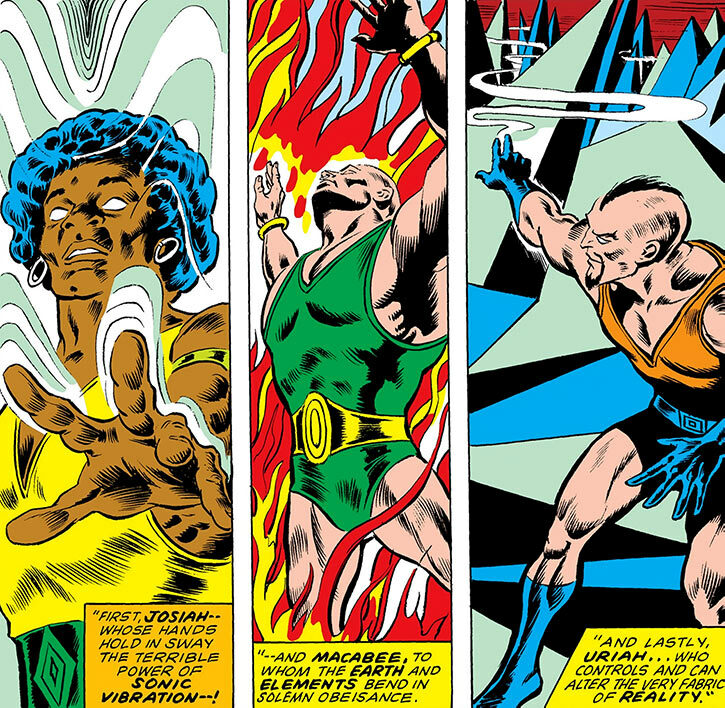 However, Moondragon reached him along with Daredevil and the Black Widow. She depowered using the obvious solution – she reshuffled his intraform molecular migration. We’d all have done the same, I think. The Dark Messiah hasn’t been seen since. Thus, in which mental and physical state Mordecai Jones was left is unrevealed. The Dark Messiah genuinely believes that he’s the new Christ. With the important difference that his agenda involves very little love but lots of violence, smiting and destruction. He constantly makes references to his supposed near-divine, prophetic pseudo-Christian status. He also speaks English from the King James Bible. This was later shifted to Asguardian -style pseudo-Shakespearian English, perhaps by mistake. Mordecai Jones’ overall behaviour didn’t make any sense. He didn’t have a clear goal – much less a strategy. One gets the impression that he knew that he wasn’t a real messiah nor divine. If so he was just ranting, causing chaos, and posturing in an incoherent effort to deny this truth. Back when he made efforts to sound like an old Bible, Mordecai excelled at coming up with impressive and thunderous statements in a, well, Biblical style. Based on this it is possible that he grew up with unusually heavy exposure to this text. As the son of a preacher man or some such. Attraction/Repulsion is Limited to Repulsion. Disintegrate may be limited to unmoving targets such as walls, as it takes some seconds to build up. Force Wall has a +35 Special Bonus to Volume. Originally, maintaining the Force Wall prevented him from using his other energy powers, but that limitation soon disappeared. Mind probe only allows for sensing surface thoughts, as if the target were thinking aloud. Lightning Reflexes, Misc. : the Dark Messiah was once accompanied by three super-powered minions. The three disciples share the same stats, though they have different Powers. Uriah has Illusion: 09 (Limited to simulating alien environments), which can be Combined with Magic blast: 06 that affects everyone perceiving the illusion – but using Magic Blast breaks Illusion and Uriah needs a Dice Action and three Automatic Actions to recharge both Powers. Area Knowledge (San Francisco), Familiarity (Street culture). Partial Attack Vulnerability (-1CS RV against Character Interaction based on Christian scripture). There is not enough data to determine how the disciples should be handled in game terms – they might be Connections, or Sidekicks, or the result of a Bestow Power used by the Dark Messiah, among other possibilities. Energy beams ● 23 points ● Descriptor: Cosmic energy ? Huge force bubbles ● 56 points ● Descriptor: Cosmic energy ? Create Continuous, Impervious Object 14, Limited 2 (only transparent force bubbles), Bonus 2 (the Volume of the objects is increased by 35 Ranks). Early on this Power wasn’t Continuous. “Omniscience”, he sayeth ● 10 points ● Descriptor: Cosmic energy ? Mind reading 10 (Limited to Surface Thoughts). Teleport 8. Any specifics are unrevealed, and there’s a significant chance that it’s actually performed by outside machinery. Evasion, Increased Initiative, Move-by Action. Weak identity Dark Messiah’s Will Defense drops to zero against attacks aimed at his sense of identity, including simple Persuasion. And as degrees of success acrue, his odds of killing himself to stop the dissonance sharply increase. Delusional Jones is convinced that he’s a supernatural messianic figure. But though it sounds impressive, he isn’t coherent. Trade-off areas. Attack/Effect PL 13, Dodge/Toughness PL 13, Parry/Toughness PL 13, Fort/Will PL 10. Points total 270. Abilities 90, Defences 18, Skills 26, Powers 105, Devices 0, Advantages 31. Equiv. PL 18. Disciple enhancements ● 10 points ● Descriptor: Cosmic energy ? Disciple power ● 20 points (average) ● Descriptor: Cosmic energy ? Josiah — Ranged sonic vibration Damage 8 (16 pts). Environment 4 (Light 2, Visibility 2) (1 pt). Burst-Area 2 Affliction 6 (Dazed/Exhausted/Incapacitated, resisted by Will), Quirk (can only affected people who just were in the Environment during the previous round) (23pts). Create 8 (Rock/Earth) Continuous, Extended Range, Innate, Limited: needs ground/rock. Ranged Burrowing 8, Affect others. Ranged Affliction 8 (Hindered/immobile/Paralysed, resisted by Dodge) Continuous, Cumulative, Limited to targets on the ground, Resistible (Fortitude). Area Burst 2 Affliction 8 (Hindered & Vulnerable, Defenseless & Prone, resisted by Dodge), Extra Condition, Concentration, Instant Recovery, Limited Degree, Limited to targets on the ground (20 pts). Deluded These dudes are a badly deluded religious trip due to the Dark Messiah messing with their mind. That makes them easy to manipulate. Trade-off areas. Attack/Effect PL 8, Dodge/Toughness PL 4, Parry/Toughness PL 4, Fort/Will PL 3. Points total 45. Abilities 8, Defences 9, Skills 6, Powers 20, Devices 0, Advantages 2. Equiv. PL 3. Source of Character: Daredevil circa 1972. Helper(s): Peter Piispanen, Kal El el Vigilante. Writeup rewriten on the 2nd of February, 2013.